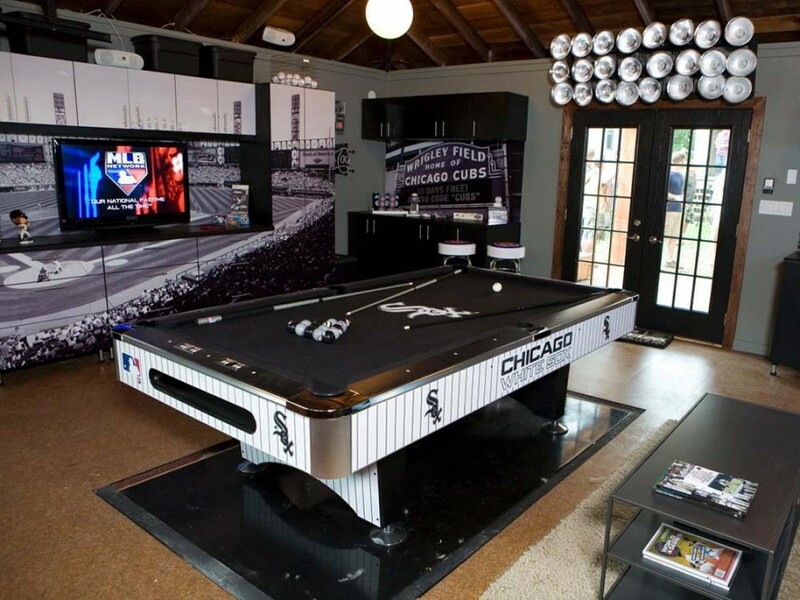 Favorite sports teams always make good foundations for decorations. 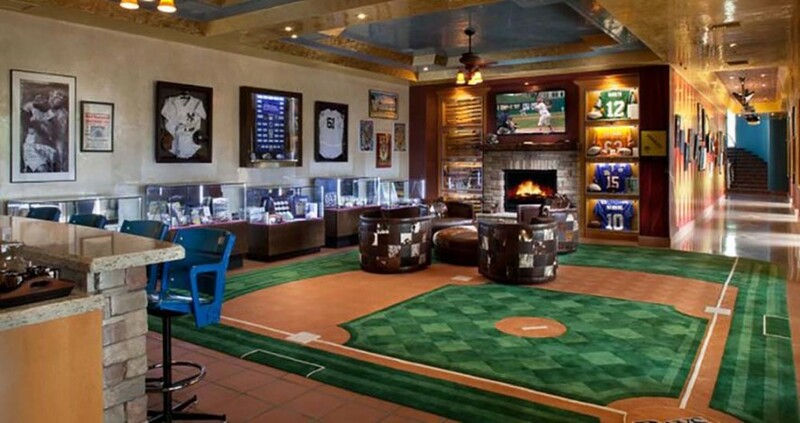 This room features a baseball theme and leaves no question as to who the family is rooting for. 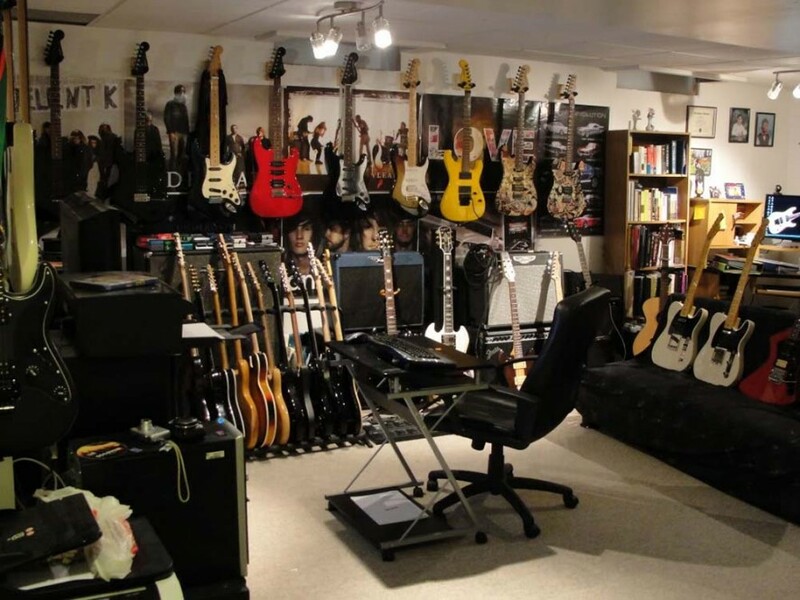 This basement is more of a music studio with enough guitars for a large scale jam session. The wall racks make them easy to store and show off at the same time. Small spaces can still make nice get away areas. 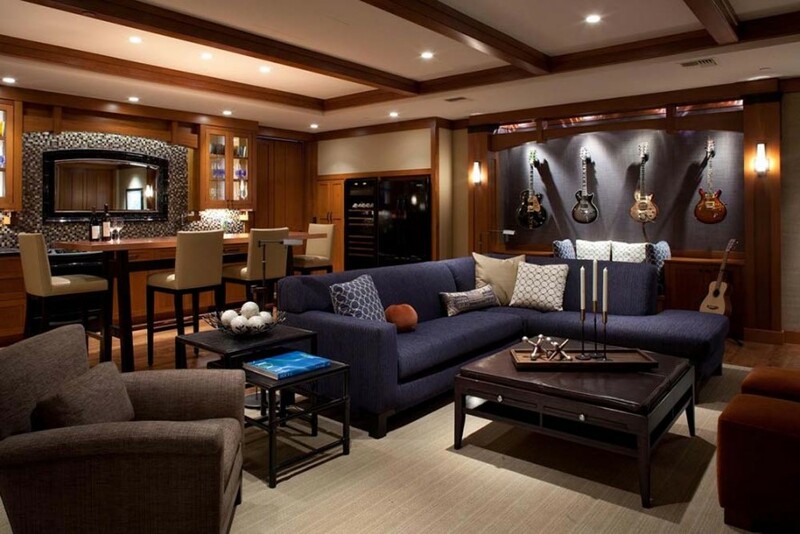 Some basements only need a couch, small entertainment area, and a little storage. This design is straight from the 50s with the back of a Chevy made into a couch to prove it. 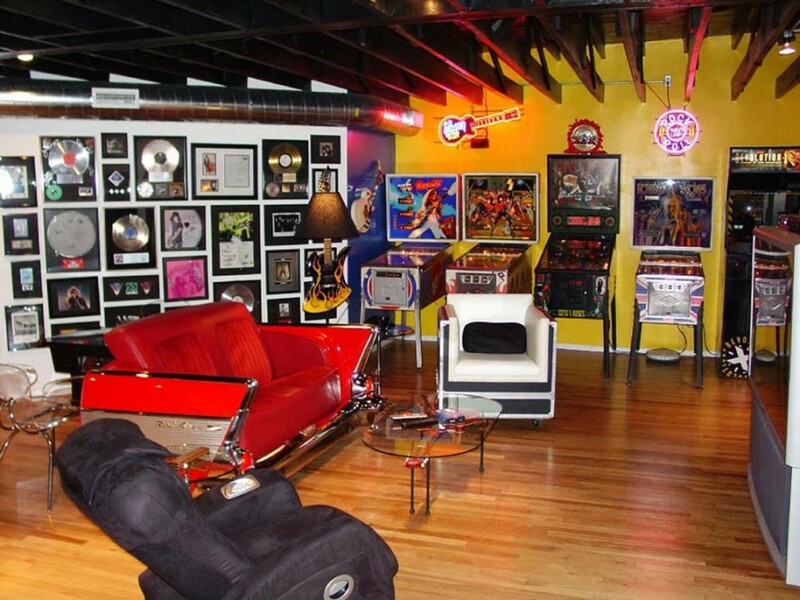 Add in some records and pinball machines and there is plenty of decoration and entertainment. Who wants to watch sports in a bar when this basement is available? 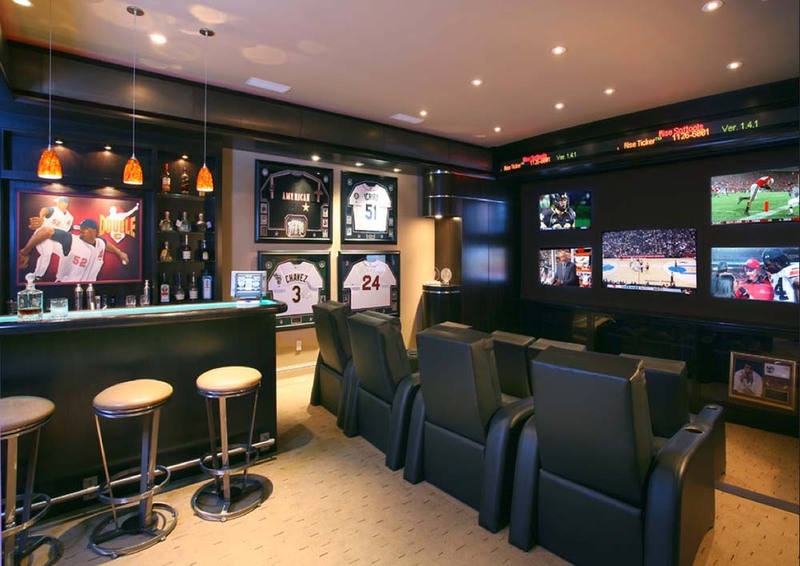 The stadium seating ensures that no one will ever have a blocked view and the multiple TVs can show many games at once. This classy style is highly versatile and can serve children who have friends over or a parent wanting to get away. The comfortable seating and open space can be used for many things. 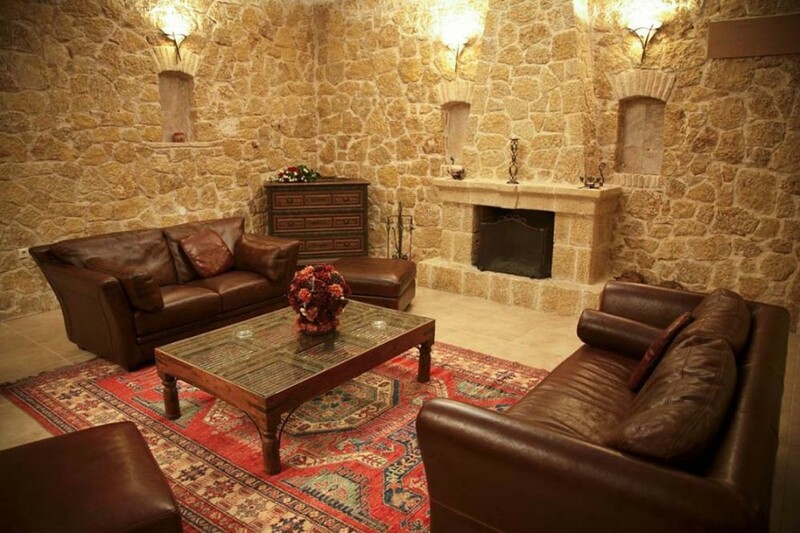 The stone walls in this basement could make it feel cold and dark, but the warm colors added in with the couch and rug bring a relaxing feel to the room. 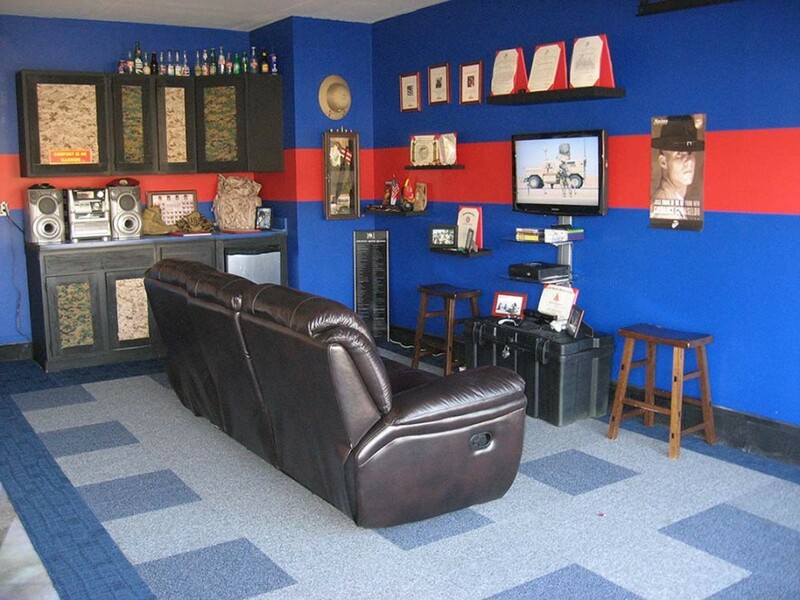 For the man who loves the second amendment, this basement is more than just a storage area. 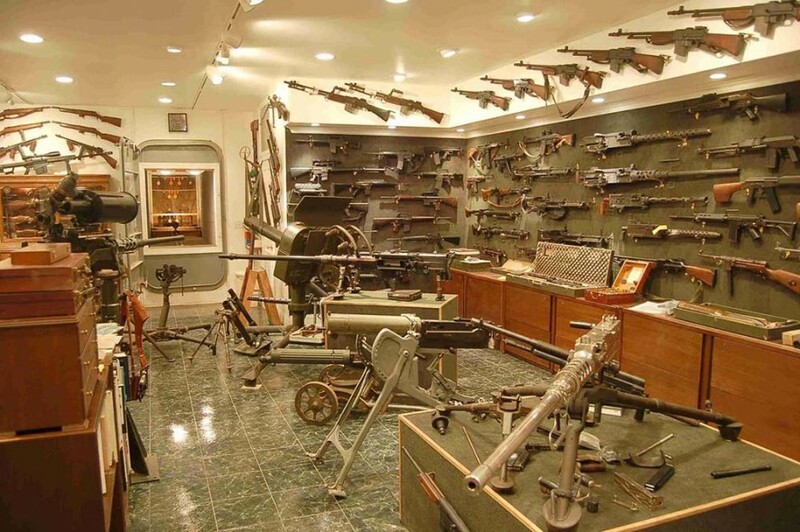 The space can also display special guns and other items like a museum for him and others to enjoy. 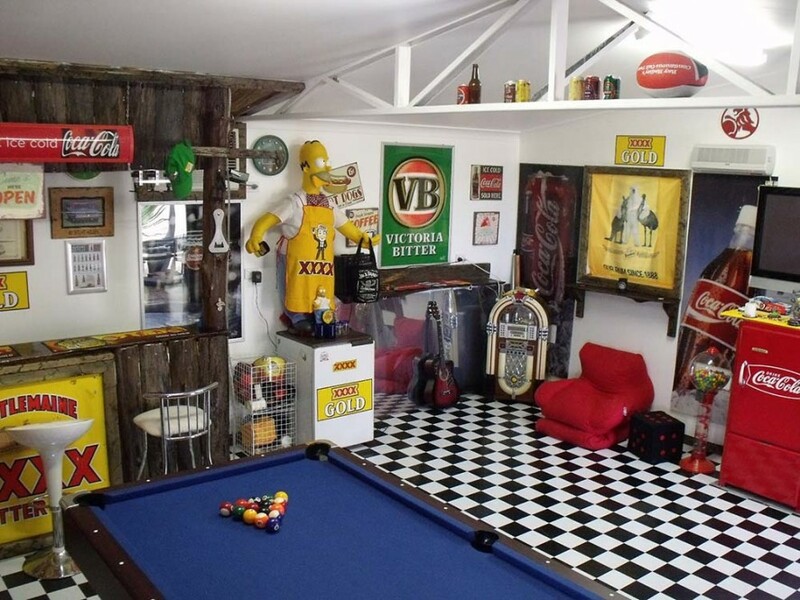 You can almost see the local band hanging out and creating lyrics in this space. It is a great place to relax, have a drink, and enjoy music. 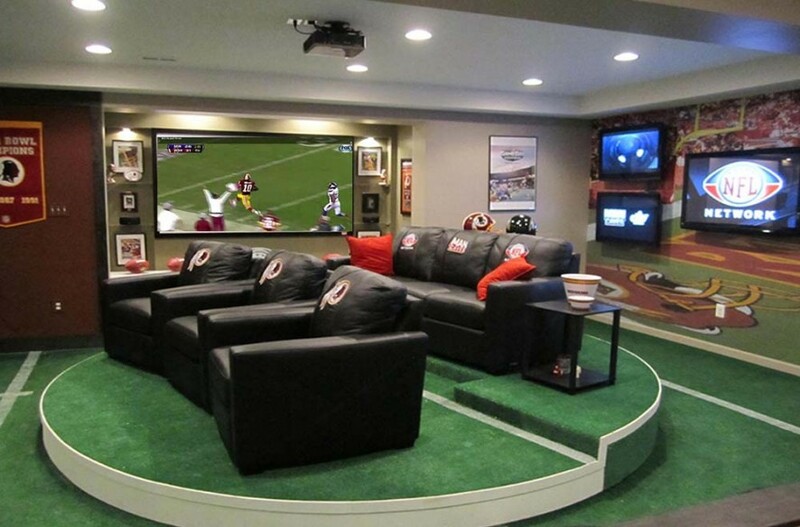 Sports lovers want to put focus on their TVs and the jerseys on the wall emphasize favorite teams and players. 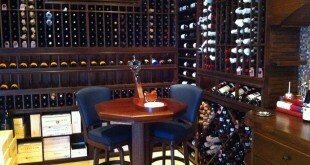 The dark colors are accented with light colored floors and stools at the bar. No man can ever have enough garage space and some are able to turn the basement into a second garage. 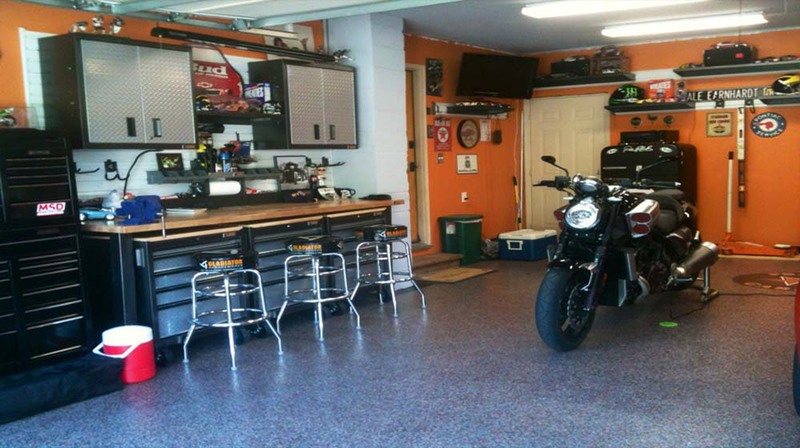 This space is perfect for working on bikes, storing tools, and hanging out. 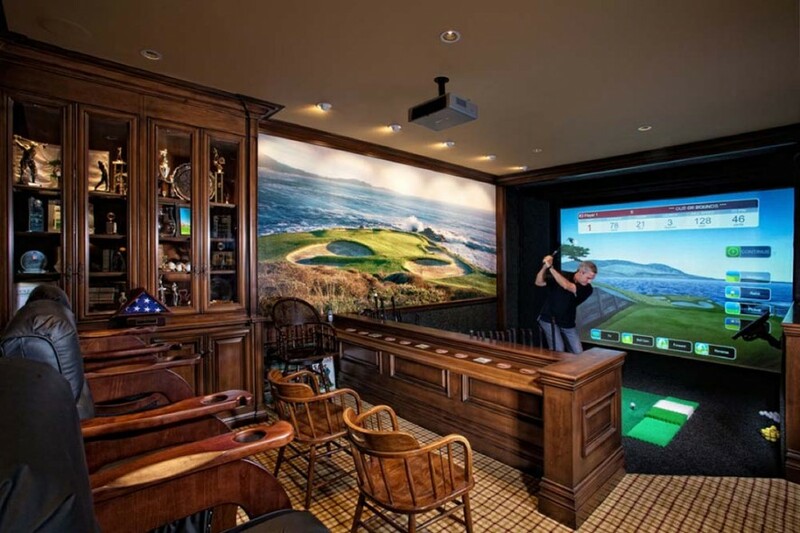 It is not always nice enough to golf and this basement ensures that golf is always an option no matter what the time of day or temperature. The plaid flooring brings an even deeper golf element into play and the seating allows guests to join in for a round. The basement doesn’t have to look like a basement, it can also take on more of a garage feel. 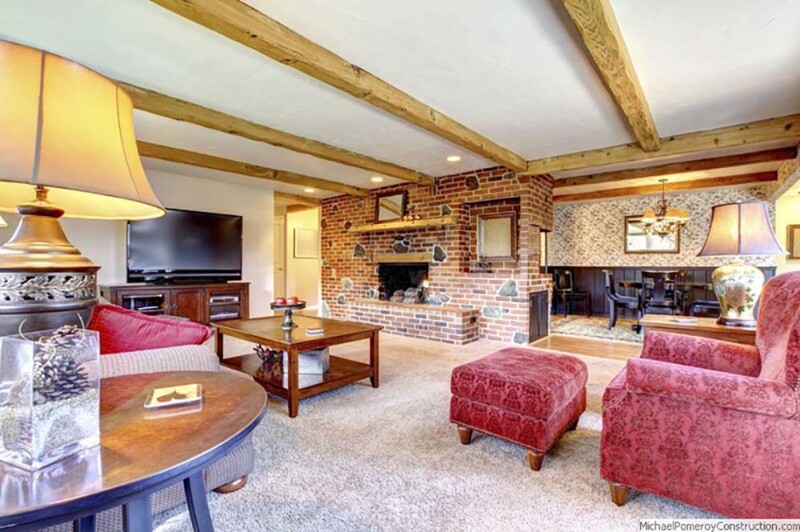 Keep things rough and add a few cozy items around the TV and the space is perfect for manual labor or relaxation.  Small basements should still not be wasted by just housing the water heater. 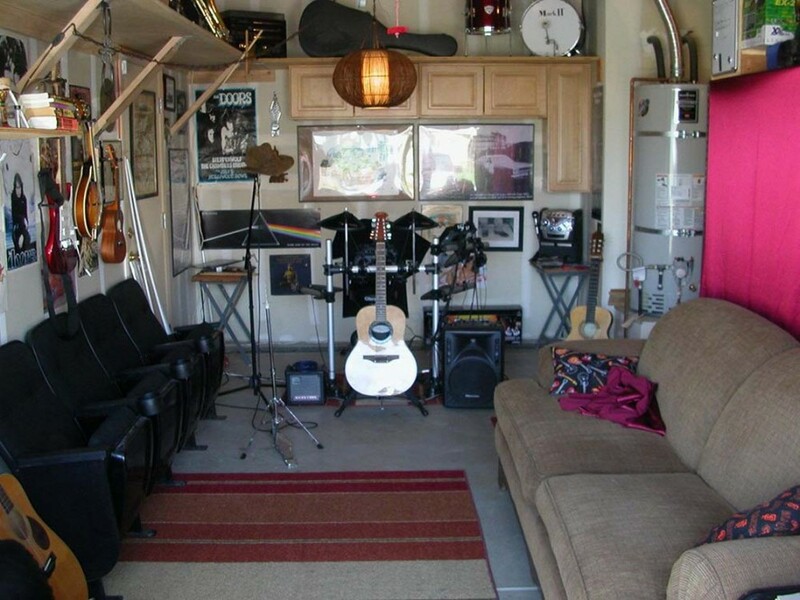 Add a few couches and some instruments and they become the perfect place to jam. 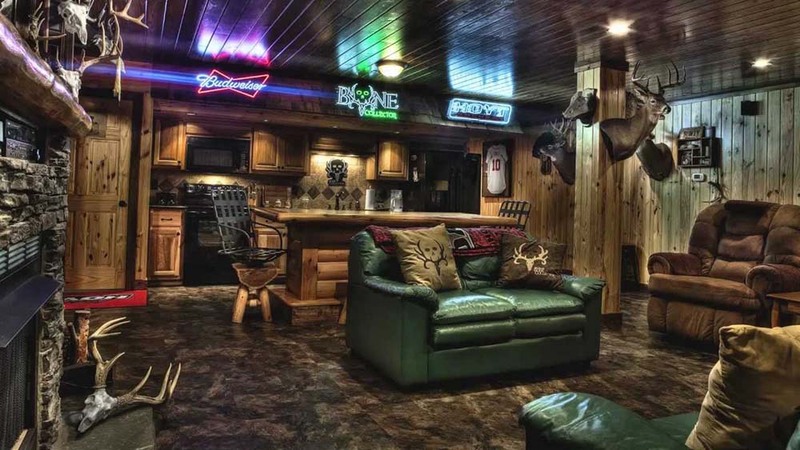 This basement does not have a lot of natural light, but the neon lights on the wall bring a unique style to the room. The wood walls and mottled floor look grand together and the colored couches bring an even more natural feel to the space. 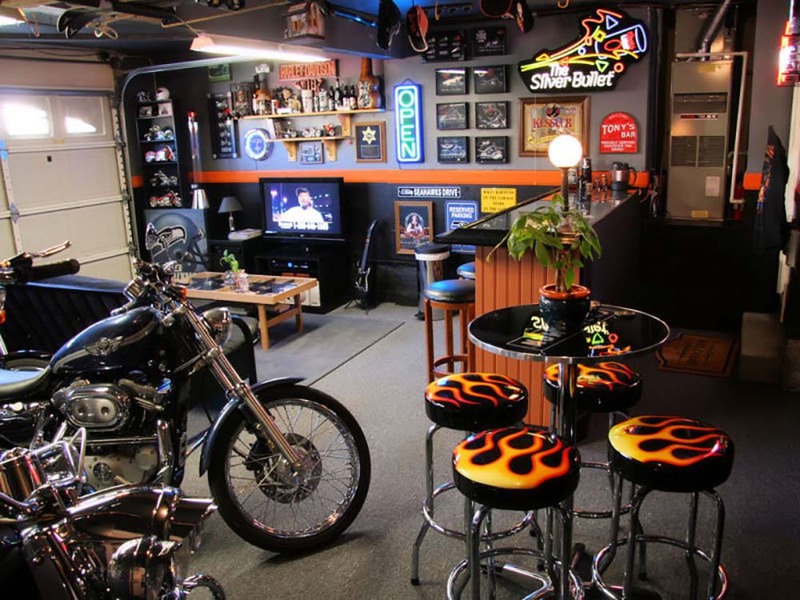 Some basements look fantastic with a diner feel. The checkered floor and red highlights makes the area feel like an old diner complete with an bar for breakfast. 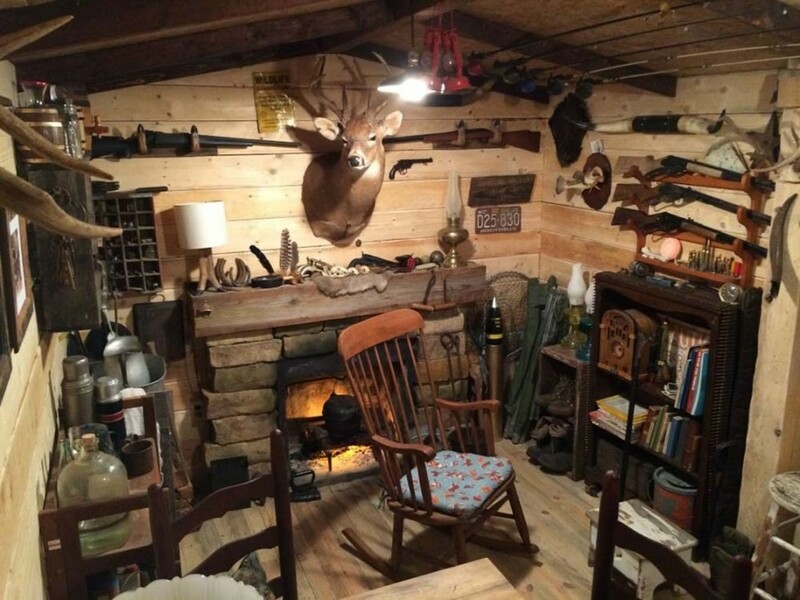 Don’t have a cozy hunting cabin, but want one? The basement can transform into something like this, which looks and feels like the perfect hunting getaway. 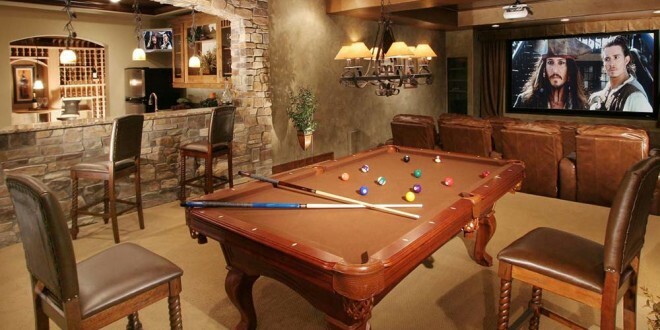 For families that can’t get enough basement, this large basement is a haven. The field is a great place to play a small game no matter what it’s like outside and the stadium seats along the bar complete the look.